110Xi4 Direct Thermal-Thermal Transfer Bar Code Printer (203 dpi, Serial, Parallel, USB and Internal ZebraNet 10/100 PrintServer Interfaces, 120VAC Cord-NA, 16MB SDRAM, ZPL II, XML, Clear Media Side Door and Media Hanger) The workhorse of the Xi product line, the 110Xi4 was built on the legacy of the Xi series of products. The 110Xi4 was developed to improve overall operational productivity and efficiency in a variety of environments. 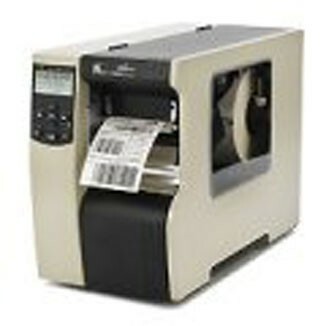 The 110Xi4 printer is ideal for a variety of applications, including top-side and bottom-side circuit board labeling, product identification labels, serial plate labels, product labels, surgical tools and equipment, diagnostic kits, vials and slides, and others. Built RFID Ready (upgrade kit for UHF EPC Gen 2, Class 1 compliant RFID enablement coming soon), the 110Xi4 allows you to upgrade to RFID technology in the future, providing solid investment protection. Label Width: 0.665 in. - 4.375 in. Ribbons: 1476 and 984 ft.